In a baseball organization, everyone employee has their role. In a rather simplistic overview, here are some key positions. The owner finances the team. The general manager assembles the best team with the given budget. The Manager makes the in game decisions. Trainers need to keep players healthy. The 7 Line Army invades enemy ballparks. Equipment managers make sure players get the gear they need. The scouts find talented players worldwide. In other words everyone has a job to do. On this basis, we should judge Sandy and if the extension was justified. Let’s look at the moves he made. Just looking at wins and losses is overly simplistic. After seven seasons in this role, Sandy is the second longest serving GM in franchise history after Frank Cashen who served for 12. Sandy has without a doubt made some excellent moves. He deserves the credit for trading RA Dickey after a 2012 Cy Young award winning season. This was a gutsy move and an excellent market read. Dickey went back to being an average pitcher who is an innings eater. In return we got the mighty Thor who was excellent in his first two seasons. Travis d’Arnaud was also an improvement over Thole, although his Achilles heel is his… Achilles heel. Staying healthy for a full season is not d’Arnaud’s forte. With that said, he was a big part of the 2015 World Series run. The second best deal was the Cespedes trade. While giving up Fulmer hurt, this deal put the Mets over-the-top. Without Cesp, the Mets would not likely have made the postseason in 2015 nor 2016. In 2015, Sandy made other solid moves. Getting Johnson and Uribe added much needed depth. Addison Reed was another great move. It was a classic example of buy low, sell high. The Mets got Reed for two players yet to have any impact. Once it became clear the 2017 Mets were going nowhere, Sandy traded Reed for three top 30 Red sox prospects. One can make the case the Reed was the 2016 Mets MVP. One brilliant deal that people often forget about was when Sandy got Neil Walker for Niese. Niese had little value and the Mets needed a new second baseman to replace Murphy. (I know. Murphy is a sensitive topic.) Sandy simply flipped them and salary wise they were being paid very similar amounts. The Mets got a guy who put up an OPS of .806 in his two seasons and was a real force in 2016 before the injury. Prior to 2014, the Mets signed the Grandyman. At the time, there were a lot of question marks. He was on the wrong side of 30 and many thought that he was being overpaid for a player coming off an injury riddled season. While Grandy had a rough 2014, the next two seasons proved to be excellent. He evolved into a walks machine. Interestingly enough, Grandy had only 9 fewer home runs than Carlos Delgado who also played three years and change for the Mets. Unfortunately, Sandy also had blunders. Most Mets fans feel that he misevaluated Murphy’s potential and thought that the surge in the second half of 2015 was a fluke. The other example was Justin Turner. After being released by the Mets he went on to become a superstar with LA. Both these guys are very debatable topics as no one in the baseball world thought they become what they became. However, there is plenty of criticism for other moves. There were moves that left us scratching our heads at the time they were made. After trading Beltran for Wheeler, it seemed that the door was open for Angel Pagan to become our centerfielder. Instead, Sandy traded the 2010 WAR leader for the lackluster Andres Torres. Pagan helped the Giants win two World Series trophies over his 5 seasons there. Torres left and was forgotten after one season. For all the Moneyball fans, you know that the best players to get are ones who have good reputations on the field and bad ones off the field. The Brewers knew that and took Francisco Rodriguez off our hands. While the Sandy needed to get rid of K-Rod, he could have gotten something of value back. Instead it was just a player dump. The two guys we got in return are part of the foggy era of the early 2010’s and no one remembers them. Since leaving the Mets, K-Rod has added another 146 saves. The 2015 Mets had many things go right. One move that did not was signing Cuddyer. The predictions that he was too old proved to be way too accurate. Sure he was a good clubhouse influence but he came at the expense of a first round draft pick. On the field, he was clearly not the all-star of years past. Time will only tell what this move cost us in terms of the lost draft pick. Possibly the most frustrating move was trading Jay Bruce away. While the Bruce for Herrera move was good, it is not clear why they discarded Bruce for a no name minor leaguer. Why couldn’t Sandy get someone of value? It would have made more sense to hold onto Bruce and give him a qualifying offer at the end of 2017. We would have either ended up with Bruce in 2018 or a high draft pick. If the Mets wanted a prospect, they didn’t go about this intelligently. This was just a salary dump plain and simple. The final topic to discuss is how well Sandy drafts players. As a general rule, each draft should yield a couple of impact players as well as others who are major leaguers even if they aren’t stars. While the Mets are not the best at the draft, they improved immensely under Sandy. If we look at the drafts from 2011-2014 the Mets picked Fulmer, Nimmo, Cecchini, Plawecki, Reynolds, Smith and Conforto in the first two rounds. Gsellman, Nido, Verett, Pill, Taijeron and Sewald were later round picks who have made it to the majors. Look at previous drafts from a decade ago and you’ll want to cry. On this we need to give Sandy credit. Seeing the full picture on a draft takes at least a decade and it fair to say that one day we will look back and see how much Sandy improved the team in this department. While fans are angry now at the ownerships lack of leadership, we need to put things into perspective. Sandy is not a bad GM. He took us to the World Series and we made the postseason in back-to-back years. That is nothing to snuff at. There have been plenty of problems mainly with mismanaged injuries. This can be argued as his biggest flaw. 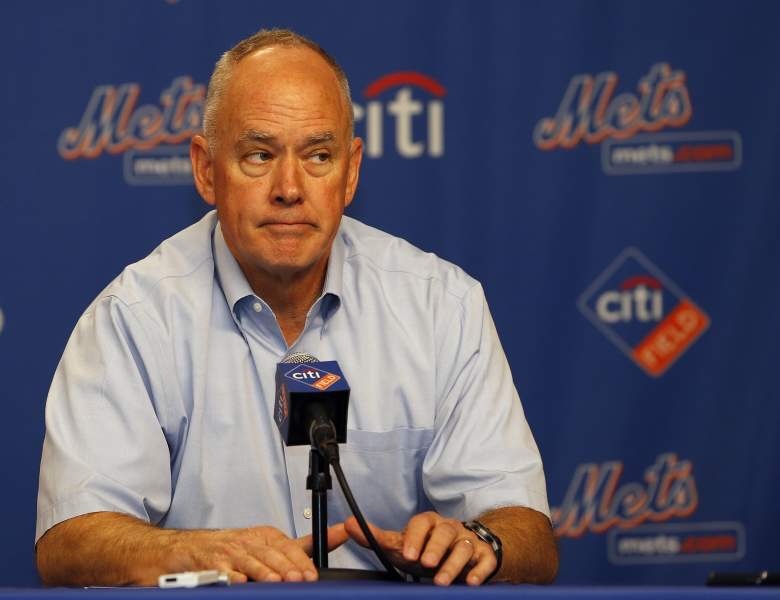 Injuries are part of the game but they seem to decimate the Mets way too often. Let’s hope that with this boost of confidence in Sandy Alderson, the Mets can turn it around it 2018.